The Terry Cloth Sock Aid takes the hard work out of putting socks on, making it a quick and easy process. 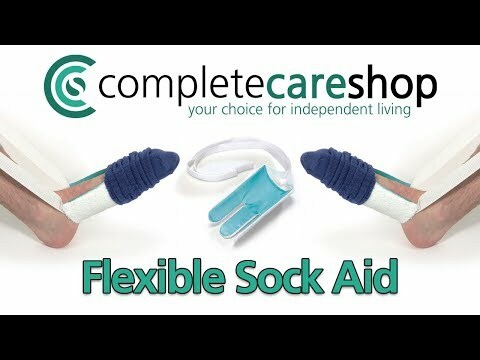 The flexible plastic sock aid has slits in its plastic core that allow it to bend around the heel. The inside is lined with nylon to reduce friction on the foot and heel to ensure the sock moves easily onto the foot. The outside of the sock aid is lined with a terry cloth cover to hold the sock firmly in place until it is comfortably positioned correctly on the foot. Two pulling tabs with loop handles permit one-handed application. Hand wash only. After my accident dexterity has been a problem now with the sock aid I can put my socks on marvelous. Struggling to get socks on due to two fractured vertebrae, so this little device is just perfect for me. Socks slipped straight on with no drama.